IN AN Eastern factory, the other day, a score of men crowded around a giant press. The machine towered twenty-five feet in the air. It weighed as much as four locomotives and its massive jaws crunched steel plates as though they were made of paper. As the group watched, the operator moved his hand a few inches. It crossed the deadline into the danger zone of the crushing jaws. 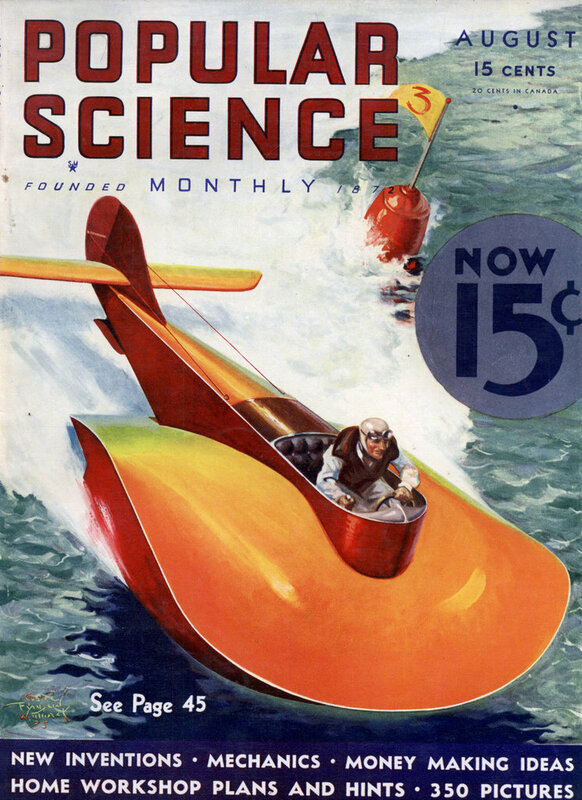 Instantly, as though a spell had been cast upon it, the mechanical monster stopped, upper jaw poised in midair. The operator removed his hand. The machine went on. A dozen times, this miracle happened while the group watched. The moment the operator’s hands were in danger, the machine stopped and couldn’t be started again until they were removed. An unseen eye, an eye made of glass coated with a rare earth metal, was guarding the workman. Focused upon this photo-electric cell, a beam of light marked the danger line. When a hand crossed this line, it intercepted the beam, cutting off the light that reached the cell and stopping, with the speed of electricity, the operation of the machine. This is but one of a thousand amazing, magical tasks now performed by these “tubes that think.” Ranging from the size of a peanut to the size of a pumpkin, the modern photo-electric cellâ€”the electric eyeâ€”has found a host of uses. It is sorting beans and buttons, turning on lights and opening doors, calling the fire department and timing races, stopping elevators and measuring stars a thousand times too faint to see. It was an accidental discovery, made some forty years ago, which led to this modern magic. Heinrich Hertz, the German physicist who first reported . the existence of radio waves, noticed that more electricity flowed through an arc lamp when it was exposed to ultraviolet light coming from another lamp. In searching for an explanation, Dr. W. Hallwachs, another German experimenter, hit upon the idea that one of the rods of the fast-burning arc emitted particles of electricity when struck by the light. This laid the foundation for the photo-electric cell, which, in the past decade, has become the wonder-tool of industry. The commonest type looks like a small radio tube and costs from $7.50 to $20. At the center is a platinum or nickel ring. Around it, either in the form of a shield or as a coating on the inside of the glass, is a layer of light-sensitive metal, such as potassium or caesium. When the tube is hooked to an electric circuit, the central ring forms a positive electrode and the layer a negative one. The space between them acts as an insulator and prevents current passing across, ordinarily. But when the cell is struck by light, the layer shoots off particles of negative electricity. They rush across the gap, forming a bridge of electrons that allows current to flow through the tube. The size of this bridge, and consequently the amount of current which flows across it, is directly proportional to the amount of light striking the cell. In this way, the electric eye makes and breaks circuits in response to lights and shadows. Relays amplify the feeble currents of the cell a million times to perform some of the heavy tasks for which the tubes are now used by industry. Thus, in a Pennsylvania coal mine, heavy doors swing open on their hinges at the approach of a dump car and close again behind it, operated by a beam of light. In a western elevator, wheat is weighed by an automatic device in which the arm of the scales intercepts a ray of light at the desired point and shuts off the flow of grain. In an Ohio steel mill, ten-ton ingots rush back and forth through huge rolls, reversed by their shadows. Not long ago, a large department store in the shadow of the Empire State Building, in New York City, faced an unusual problem. In former days, its chimney rose far above surrounding structures. Now, it was dwarfed by the towering tip of the world’s tallest building and, when the wind was right, smoke drifted directly across into the windows of the skyscraper. Protests poured in. The Smoke Abatement Commission sent warnings. Good will, so important to a department store, was endangered. Officials of the company appealed to a group of electric engineers. They studied the problem and installed a robot smoke watchman. It consisted of a beam of light passing through the chimney and striking a photo-electric cell. When the smoke becomes denser than the law allows, the light reaching the cell is reduced and the automatic watchman rings an alarm bell in the boiler room, flashes on a light in the chief engineer’s office, and jots down a record of the exact number of minutes excess smoke pours up the chimney. Guided by such instant warnings, the firemen have been able to regulate their furnaces and complaints have ceased. In a similar manner, ships at sea are safeguarded against fires. In the hold, beams of light are trained upon photoelectric cells which sound sirens if smoke begins to dim the light that reaches them. Such alarms have also been installed in homes and warehouses to give speedy warning of a starting fire. A special meter which uses an electric eye to determine the density of smoke has been devised for giving a check upon combustion and the efficiency of a heating plant. Recently, by means of a similar device, the U. S. Public Health Service began recording the amount of ultra-violet light which passes through the smoke-laden air above big cities. When the photo-electric cell is equipped with special filters it becomes sensitive only to certain kinds of light rays. Thus it is a simple matter to measure the proportion of infra-red, ultra-violet rays in the light, at any time. Another column may soon be added to the daily tabulations of the U. S. Weather Bureau. Tests are being planned for determining the amount of illumination from the sun which reaches the earth each day, together with the amount of moonlight which reaches the earth each night. Special electric eye recorders are being developed for the purpose. IN NEW YORK CITY recently an inventor demonstrated the manner in which a battery of robots, under the command of a magic lamp, would attack a burglar attempting to crack a safe. In the wink of an eye, after a beam of invisible ultra-violet light in front of the safe is intercepted, the robots go into action. A burglar alarm wails. A flashlight flares. A camera snaps a photograph of the intruder, while a fourth device volleys out tear gas which leaves the thug struggling around helpless until the police arrive. The fight against another member of the underworld, the counterfeiter, is also aided by the magic eye. Slight variations in the color of banknote paper are being noted in one American money printing plant by photoelectric detectors, so all the bills will be of uniform hue, thus making it easier to recognize a counterfeit. The fact that different shades of the same color reflect different amounts of light is the basis of many industrial applications of the electric eye. In Detroit, Mich., automobile factories are installing automatic “electric eye forges.” When a bar of steel in these electric heating chambers reaches the desired temperature, its color, always the same at that point, affects a photo-electric cell and the bar is automatically removed. English scientists, with the aid of a magic eye, are searching for new steels at Sheffield University. It records the rise and fall of temperature in the experimental electric furnaces, keeping an accurate record by the color changes of the metal. A rule in factories where high-priced cigars are made is that the top layer of every box must contain cigars of uniform hue. Tobacco the same color is now picked out for cigars by photo-electric cells which work faster and more efficiently than human eyes. MATCHING delicate shades of cloth and dyes is also accomplished in the same manner. A colorimeter, recently devised, picks out variations in hues imperceptible to the most highly trained human eye. Another application of the ability of the electric eye to distinguish shades of color is a remarkable device invented by a London, England, doctor. It separates the hue of a paint or dye into its three primary colors and gives the exact proportion of each. Thus, the identical shade of an unknown dye or paint can be reproduced at any time without costly experimenting. Again, the amount of haemoglobin, or red coloring matter, in the blood is measured in hospitals by means of a magic eye. A thousand dollars a week is being saved in one New York newspaper plant by an ingenious apparatus which looks like a lathe, but which, under the guidance of a light-sensitive cell, makes half-tone engravings and three-color plates in a sixtieth the time required by the old acid-etching process. Plates for half-tones, the ordinary black and white pictures in newspapers, are turned out by the photo-electric lathe at a cost of only three-quarters of a cent a square inch. In other ways, electric eyes are helping get out the daily paper. In one Eastern plant, presses are equipped with an automatic device that stops them instantly if the paper breaks. Light, directed upward from beneath the paper feeding into the press, strikes a photo-electric cell if the ribbon parts and thus avoids costly loss of time and paper. To determine if paper is sufficiently opaque to keep printing from showing through and disturbing the reader, one New York daily examines rolls with a photo-electric opacity meter. Five hundred samples have been analyzed in this way to find which is best suited to the needs of the publication. A few months ago, in the Texas oil fields, another problem was solved by an electric eye. In the treating process in refining gasoline, after the cracking is over, it is important to have all the fuel of uniform color. Fuel darker than standard, contains too much carbon. Special watchmen were placed in one plant before glass tubes through which the gasoline ran. But human eyes tire easily and color changes frequently went unnoticed. So the job has been turned over to mechanical eyes that never tire. Rays of light pass through the tubes to photo-electric cells. The slightest color variation in the fuel causes a change in the amount of light reaching the cells and sounds an alarm. When you go to the theater and hear a talking picture, light-sensitive caesium cells make your entertainment possible. The same sort of electric eye is used in television and in sending pictures by telegraph and radio. Caesium cells are employed because this metal is particularly sensitive to red rays which predominate in light from the incandescent lamps used in talkies and television. In the factories where photo-electric cells are manufactured, the explosion of small caesium pills within the glass tubes spatter the inside of the glass with the metal just as stucco is splattered on the exterior of a house. The pills are set off by the heat of special radio waves played upon the. tube after the air has been exhausted within it. All metals are sensitive to light in some degrees, even iron. Photo-electric cells have been made by using zinc for the lining of the glass. But only the rare earth metals, such as caesium, thallium, rubidium, are sensitive enough for use in modern cells. Over an Ohio airport, one night a few weeks ago, a big airplane wheeled in pitch darkness. Suddenly a slender white finger of light shot downward from a small searchlight mounted on the fuselage of the aircraft. It probed back and forth over the field until its beam struck a photo-electric cell near the hangars. Instantly, the floodlights flared on illuminating the field for a landing. An automatic apparatus, by means of which a pilot can turn on the lights of a field from the air, had proved a success. A similar device has been worked out to enable a flyer to switch off the lights after a takeoff by sending down a beam from the sky as he flies away. All day long, a photo-electric robot counts people entering the main Public Library in New York City. A score of others count all automobiles crossing the Ambassador Bridge between Detroit, Mich., and Windsor, Canada. Others, buried in the pavement concrete of the Holland Tunnel, under the Hudson River from New York City to Jersey City, N. J., count the cars speeding past. At the intersection of Trenton Avenue and the Lincoln Highway, in Wilkinsburg, Pa., the light is always green for traffic on the highway except when a car approaches the corner of the side street, which has comparatively little traffic. Then the light changes to red until the car has passed and then switches to green again as if by magic. Photo-electric cells and beams of light stretching across the side street automatically change the lights when a car approaches. Special tests are made on the sprinters of one Eastern university to discover where they lose fractions of a second in the hundred-yard dash. At ten-foot intervals, electric eye timing devices record their speed on paper disks, giving it to a thousandth of a second. Study of these records show where the athletes slow down and where extra training was necessary. Every time a player steps over the foul line in a Schenectady, N. Y., bowling alley, a red light flashes on. He has stepped on a beam of light trained across the alley on an electric eye. The decision of this automatic umpire is infallible and is accepted by contestants without question. TURNING on the fountain as you bend over for a drink; swinging open the garage doors as you drive up with your headlights on; cutting off hot steel rods at exactly the same length as they rush at fifteen miles an hour from the rolls; picking out rust spots, holes, and thin places in sheet metal; shunting mailbags and material on conveyor belts to the right destination, and sorting and filing cards in different compartments according to combinations of stencils cut in the pasteboard, are other astonishing feats of these light-sensitive miracle tubes. What lies ahead for these miracle cells? The most dramatic accomplishment of all, many scientists believe: the transmuting of sunlight into electric current! In several part of the world, researches with light-sensitive materials are being carried on with this end in view. In Germany, Dr. Bruno Lange, with his chemical sandwiches, has succeeded in keeping a light burning day after day with current from the sun. (P. S. M., p. 41, Jun. ’31.) 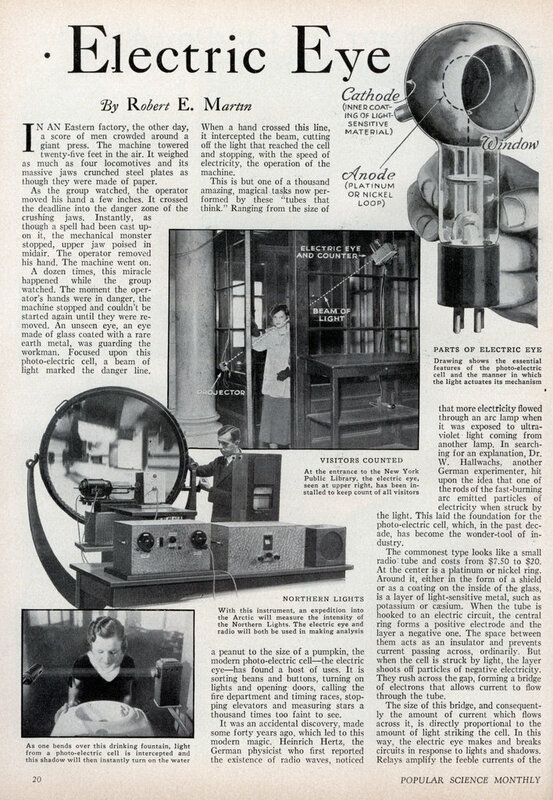 While all the apparatus so far constructed has been too inefficient for commercial application, many experts believe that the researches stimulated by the feats of the photo-electric cell, the wonder tool of today, will eventually lead to a practicable means of tapping the power in sunlight. And people are still getting body parts chopped off, because they disable safety, after all they “know better”.